Kata used to have a lot of cassettes she loved to listen to, but which at some point were accidentally thrown away by someone. One of those cassettes was of flutist-percussionist Michel Montanaro. So when she came across the concert ad by chance, we had to go. The concert was initially advertised costing 1500 HUF for tickets, but when we arrived we were told the concert was free - as was a look around the beautifully renovated Diósgyőr Castle. The healer's room was particularly interesting, and besides all the hanging herbs, it included an interactive cookbook with interesting Medieval Hungarian recipes. The musician was also having a look around before everyone settled in for the 6pm concert in the Knight's Hall. How do you find the local village pub, look across or next to the church, or where all the bicycles are parked. How do you spot the French artist, look for the person with a colourful scarf. And there he was with a bright red scarf around his neck. Montanaro is from Provence, France but has Hungarian family, so it was a bit disconcerting when he opened with an introduction in French. But he was just playing around, and after 5 minutes of quizzical looks he switched over to passable Hungarian. 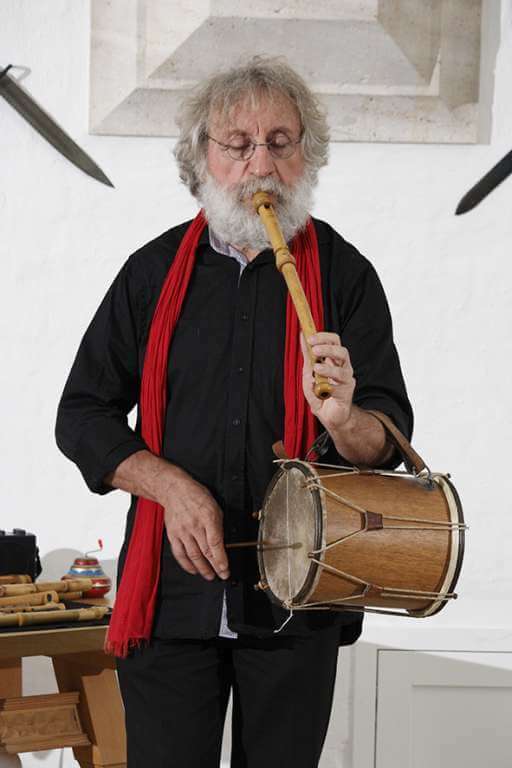 His music is based on Provencal folk music, but then goes off into improvisations. Kata had told me he played the accordion and flute at the same time, both one-handed. Because of the great acoustics he chose not to play the accordion and instead concentrated on playing two flutes or a flute and drum at the same time! The music was good, but I would have liked to hear some singing, too. His musicianship was amazing. I would have bought a new cassette (cd) for Kata, but none were for sale. Montanaro stayed around for quite some time answering questions and chatting with the audience, but we eventually wandered out, took in the beautiful sight of the castle lit up at night, and went in search of dinner. We have not found much in Miskolc in terms of good food, so we were not counting on much. Even so, Kata had spotted a place on the way in that from the outside looked to me like a pastry shop but we parked across the street at the gas station and walked over to the Végallomás. The restaurant turned out to be a hidden gem at the lower terminus for the Lillafüred narrow gauge railway. It can also be conveniently reached by tram. The Végallomás styles itself as a "bistrestaurant," and its atmosphere and decor is a mix between the modern stylish and someone's living room. We liked the oval table in the middle, and the big fireplace behind which the cash register has been built in, how the wine fridge had been built into a rustic cabinet on which the homemade bread was sliced, and the music. The wine list is good and extensive, but we began with homemade raspberry and ginger cordials (650 HUF/3 dl), which were both delicious and hit the spot. 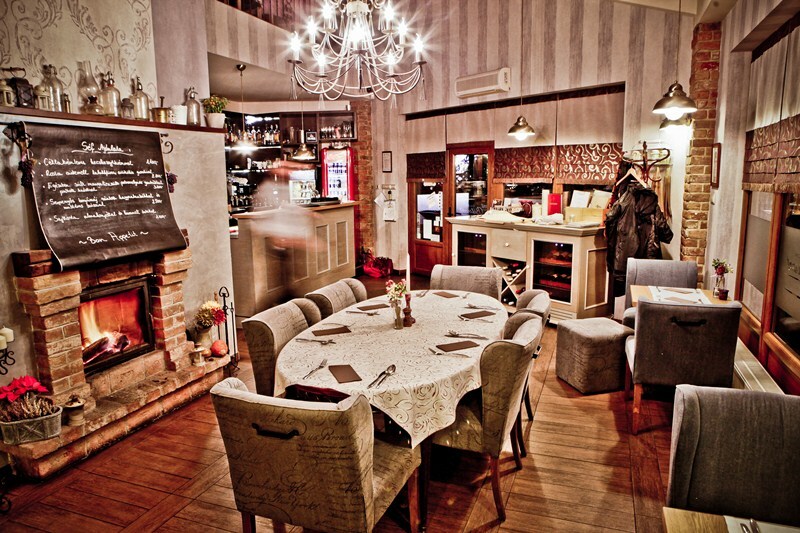 According to an internet search, it seems that the restaurant has the only official sommelier in the Miskolc area. Kata had the duck liver for the main course, which she said was excellent except for a couple stringy bits that should have been removed (2100 HUF). She also liked the drops of mango sauce along the black slate rectangular plate her meal was served on. I went for the marinated chicken breast with quinoa-sweet potato-avocado salad (2900 HUF). The chicken was cooked to perfection. The salad was an interesting and good combination, which only could have been improved by more avocado - I only found one small piece in the salad. Although I had a difficult time understanding our waiter, service was professional and friendly. Definitely worth another visit!